I'm tagging Flower Press, Mrs Eliot Books, and Notions (who have all, incidentally, had really nice things to say about my new prints - thank you!) And.... Flower Press has some beautiful new fabric, Notions has gorgeous card/brooches to give away, and Mrs Eliot has some new tea towels coming soon, so go and have a look! what does a gooseberry taste like? I had to look those up, they don't look anything like the European gooseberry. They are called Cape Gooseberries and are actually in the tomatillo family. I read they taste like a tomato/pineapple blend, is that true? We grew European gooseberries in our garden when I was growing up! The bushes are thorny and it was difficult to pick the berries. The flavor is very unique, and I think appeals more to the adult palate (we liked the red currents better and another plus, no thorns!). Thank you for taking part in the fun! Coffee...hmmm. I stopped drinking coffee about two years ago, but I still LOVE the smell. I especially miss cappucino's. Coffee looks even better placed on lovely fabric! 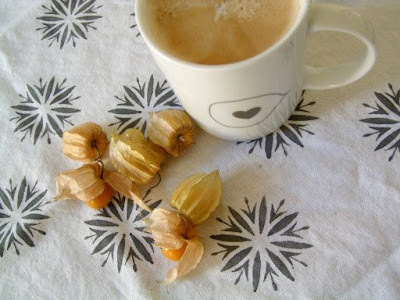 I have seen those gooseberries as decoration in desserts in restaurants. But never tried. Coffee...something I need to start ok! That is a really lovely photo! I've never had a gooseberry, but now I'm intrigued.